I never thought I would find myself homeschooling my 4-year-old son during the first part of his Pre-K year. But, as luck would have it, we were unable to get into a local preschool - instead being put on all the wait lists - after a military move to an installation we weren't expecting. But, thus is the life of a military family and, as a parent who wants my child to be fully prepared for when he enters Kindergarten, I was left with little choice but attempt to teach him at home. I know there are parents out there who absolutely love the idea of homeschooling their children. And, the "idea" of it does sound great to me. It's the practicality of ME teaching MY SON that frightens me. I'm not a preschool teacher. I had to google how to pronounce the letter "X" during my daughter's Kindergarten year (FYI, you pronounce it like at the end of fox...not the beginning of xylophone). I taught English and Spanish to high school students where we worked on literary themes, diagramming sentences, proper grammar and advanced vocabulary and spelling. I've never taught someone how to hold a pencil or write their own name. I have never had to think of silly songs and games to help them understand concepts of the alphabet and counting...and now I'm teaching these things TO.MY.OWN.CHILD. Frightening is an understatement. But, thank goodness there are a lot of online resources to help me in this endeavor. To start, I posted the question on my Facebook page of what resources and curriculum my friends who homeschool use. I searched Pinterest and Google for homeschooling printables and ideas. Then I thought about my child and what might help him learn best. So, we started our 1st week of homeschooling with the theme, "A is for Astronaut." And, I want to say a HUGE thank you to Carisa at 1+1+1=1, Jolanthe at Homeschool Creations, and Maureen at Spell Outloud for their exceptional resources and free printables on their websites. Without these, I would have been lost! We started off our morning lessons by introducing the letter A and this week's theme. 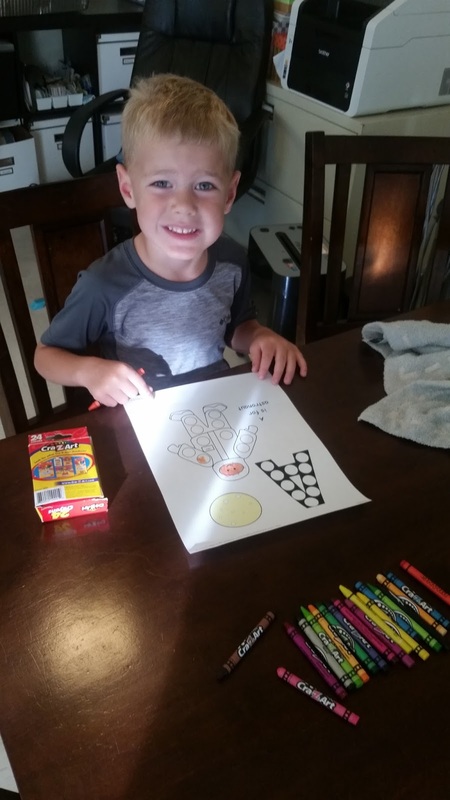 My son loved coloring the astronaut! After finishing our color sheet, we used another printable from Spell Outloud and practed writing upper and lowercase A's. We're still working on how to properly hold a writing utensil (be it crayon, pencil, marker, etc. ), and I'll be sure to have future blogs with resources on teaching this somewhat tricky skill. We also used playdough to make asteroids and moons with craters. We talked about when we see the sun, moon and stars (introducing day vs. night). 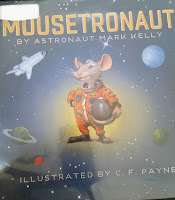 After our writing and letter practice, we had story time - reading Astronaut Mark Kelly's book, Mousetronaut. This exciting book about Meteor, the mouse, and his journey on a space shuttle mission (based off of a semi-true story) let my son and me explore the concept of counting down to lift off, the idea that you don't have to be the biggest and strongest to be a part of a mission, and working together. It also provided a great introduction to YouTube videos on the Space Shuttle Discovery launch, the Space Shuttle Atlantis landing, and a tour of the International Space Station. I highly recommend turning the volume up as high as you can for the Space Shuttle launch. It's also a great time to practice counting down from 10 and getting a little bit of exercise as you see just how high you can "lift off!" As we proceeded through our day, we took a quick break to test out some astronaut food for snack time! I didn't go out and buy anything that specifically said it was made for astronauts. 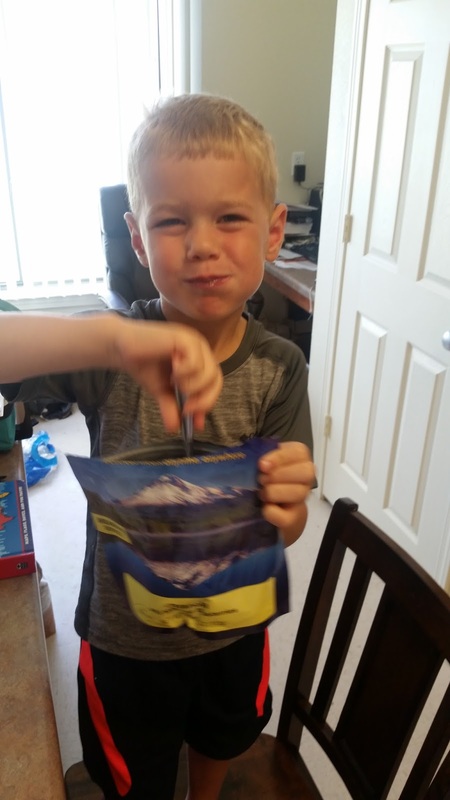 Instead, we used backpacking food packs and tasted some dehydrated food for which we practiced measuring and pouring water into the pack to re-hydrate. This was the highlight of my son's day and one of the only things he could remember doing by the end of our day! We're looking forward to the rest of our week where we'll be continuing to work on the letter A, counting from 10 to 1, tracing, and learning more words related to astronaut and space. We're also planning a field trip at the end of the week to a local space museum where my son can try to land the space shuttle in a simulator and try on astronaut suits! So, I may not have ever thought I'd find myself as a homeschool preschool teacher and I may be extremely worn out after the first day of lessons, but I'm also looking forward to this special time I get to spend with just my son. If you are considering homeschooling because you don't have any other options or just because you want to, I'm learning that it's a lot easier than I thought thanks to the abundant resources available online. Thank you to all of the homeschool educators who've gone before me and are helping another mother out!